It's Sunday for you but it's Saturday for me as I write this entry, for what it's worth, to recap what happened today (Saturday). 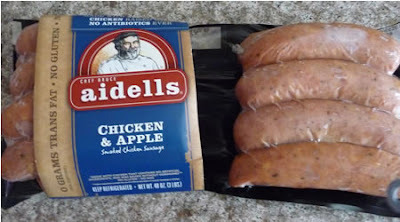 This is the brand of sausage we always get. Today they had some enthusiastic reps from the company giving out yummy samples. Since they're made of chicken we can pretend they are healthy. The only drawback to the big package is having to divvy them up into future portions using one of those Reynolds Handy Vac gadgets and throwing the bags into the freezer. 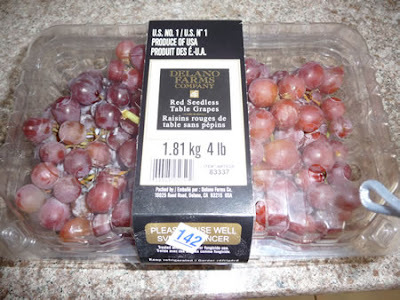 Then some uvas rojo (red grapes). Pretty boring. Kirkland Yogurt. Like my clockwork turkey sandwich I have for lunch when I am in the office, I have one of these yogurts and some teeth-breaking Kashi Go Lean Crunch cereal. Except the yogurt/cereal is every single morning. Why don't they make a 7 or 14 pack of yogurt instead of a dozen? 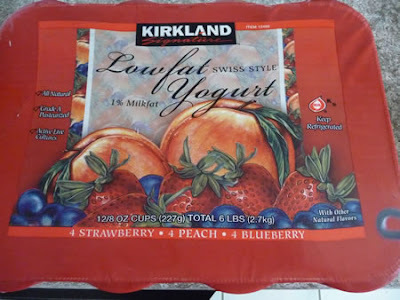 I like Kirkland because it seems to have more pieces of fruit hiding inside than other brands, for less money. 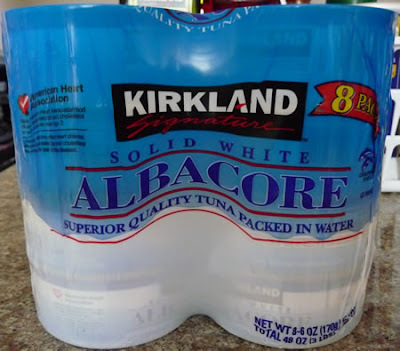 And finally, Kirkland albacore tuna! Actually the Chicken of the Sea white tuna is cheaper per can but I've become a Kirkland junkie. 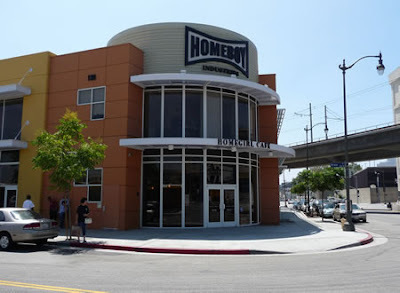 Jobs not Jails: Homeboy Industries assists at-risk and formerly gang-involved youth to become positive and contributing members of society through job placement, training and education. It was interesting reading the back of the t-shirts many of the servers were wearing: Nothing stops a bullet like a job. 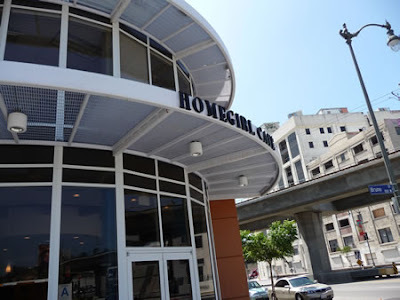 Homegirl cafe is part of their operations and occupies a portion of the first floor of the Homeboy building. The entire staff consists of young women, presumably of the type appropriate to the mission statement of the organization. They were cooking, waiting on tables, busing tables and cashiering. And doing a great job. I thing it's wonderful to have an operation like this. Here's a couple of pictures of the exterior. 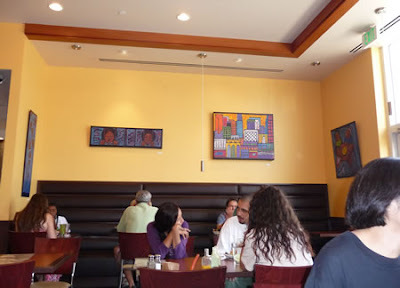 And here's some pictures of the interior. 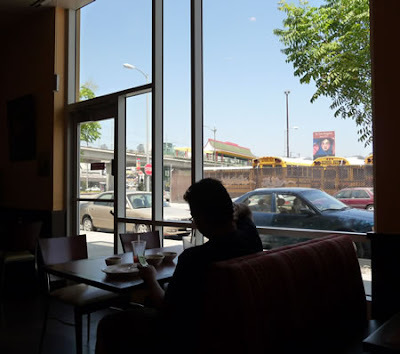 It's attractively decorated with lots of window space, a modern look and very clean as well. And here's what we ordered. 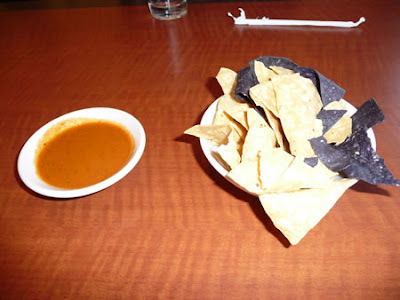 First they bring chips and salsa. Julie ordered the combo half sandwich/half salad, choosing YuYu's sandwich (turkey, mango, chipotle). I ordered a couple of tacos. 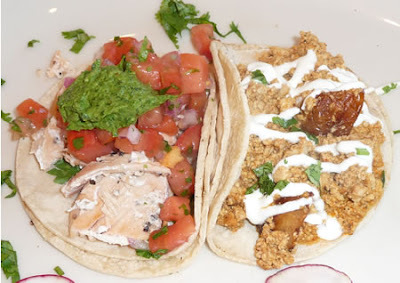 One, salmon with jalapeno pesto, and the other, tofu chorizo. Both were good; the tofu actually tasted like and had the consistency of chorizo and I'm sure it was much healthier than the real thing. 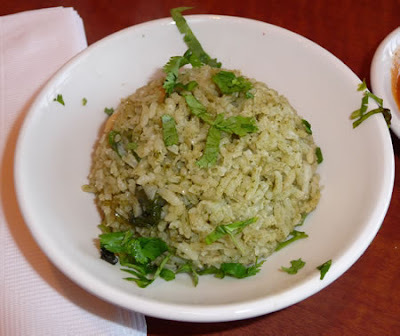 I also got a side of arroz verde (green rice). That was pretty tasty, although Tito's is still my favorite. 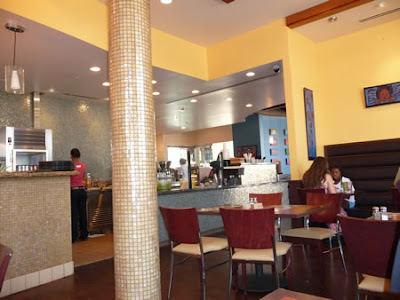 They have quite an unusual selection of tacos and the entire menu consists of dishes that are anything but run-of-the-mill. 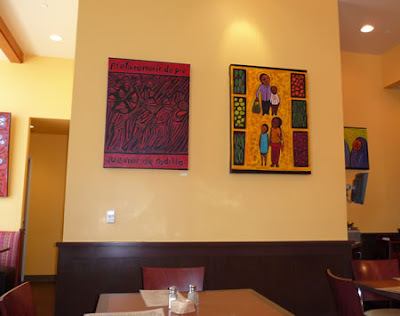 I took a picture of the breakfast and lunch menus but instead of publishing them, it's easier to read from their web page so click here if you want to see the entire menu. Lunch was fine. The restaurant was only about half-filled, nothing like the crowds standing in line at Phillipes down the street; Homegirl has the better menu if you ask me. I noted quite a few tattoos on the patrons so I guess the place attracts some homies. If you're in the area, it is definitely worth visiting. Here's the final picture from the place, taken from my seat looking out towards Alameda. Or was this taken in Beijing? Isn't that one of the Olympic pagodas and the train from the opening ceremonies in the background? Homegirl was our halfway stop on the way out to the Westside to visit my mom, who has been in the hospital for over a week now. She fell and fractured her shoulder and suffered some other bruises and earlier this week they moved her to a care/rehab facility so she can begin to have physical therapy sessions. I have to say it was a shocker visiting this place. It looks decent enough, but when we walked in, the place was filled with nothing but old people. Old people in wheelchairs, lying in portable beds in the hallway, lying on beds in their rooms, and it just depressed me to look at all of them because they seemed so helpless and weak. We went to my mom's room and she was sitting in a wheelchair by her bed and my dad was with her. She has two roommates, both of whom seem bedridden; at least my mom has the bed nearest the window and although there's really nothing of note when you look outside, it's the brightest area in the room. My parents were in good spirits, though. I told them that I just don't think of them or picture them as being "old." I see the old people lining the corridors of that facility and also lying in beds in their rooms and to me, those are "old people" but my mom and dad are out of place because they're not "old people" like the others. My mom said she feels the same way - she doesn't feel old. I don't feel old, either, and it is strange for me to know that I am older than my friends' parents were (and my own as well) when we used to visit each others houses in junior and senior high way back then. They were adults and I was a kid. But I still feel like a kid. Today it hit me - my folks are indeed old. Someone else's kids visiting that place today who saw them wouldn't be looking at them and thinking here's a couple of youngsters among the old people; they'd probably just see them as blending in with the others. I guess I never looked at it that way before. Anyway, I'm thankful for the long and mainly healthy lives both my parents have led and that they are still there for me, as well as for them being in such good spirits today. I just hope and pray for a quick recovery for my mom, and for my dad to not feel so lonely when he goes home. If you believe in prayer, please pray for them; I'd appreciate it and I know it will help. Well, I hope I didn't depress you. The tone of this blog is normally much lighter and in fact that's how today's post started out and then the latter part sneaked up on you. There's a time and season for everything and I thought today was the time to write about this particular season. Things will return to normal programming on "lighten up Monday," though.